On Monday, December 22, 31-year-old Christian Lopez-Barcelo allegedly killed a pedestrian who was running in Huntington Station, LI, after his 2009 Ford Crown Victoria taxi cab struck the runner. Raymond Sipel, 30 years old, was pronounced dead at the scene of the crash. The accident occurred just before 11 p.m., according to a news report at Longisland.com. The accident is still under investigation by Suffolk County Police Second Squad detectives. Lopez-Barcelo was taken to a local hospital to be checked out although he was not injured. He was treated for stress-related symptoms and released. So far, the only charge he is facing is operating a motor vehicle with a suspended license. The cab he was driving was impounded for a safety check, and is owned by Orange and White Taxi Company. This is a very sad situation, and while a man lost his life, the focus of this article is on driving with a suspended license. Why was a taxi driver driving on a license that had been suspended? According to one news source, Lopez-Barcelo had used a second license with a clean driving record and “slightly” different name to obtain his taxi permit. Apparently, his “real” license had been suspended, which would have prevented his employment with the taxi company. Most individual’s driver’s licenses are suspended due to DUI, multiple traffic violations, unpaid child support, etc. 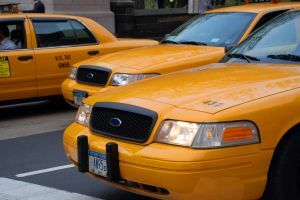 While this story does not reveal why the cab driver’s license was suspended initially, it is never recommended that anyone drive on a suspended license. As Michigan driver’s license reinstatement lawyers, we understand the difficulties people face when the privilege to drive is taken away. Getting to work, going to pick the kids up from school, attending a meeting or doctor’s appointment, or simply going to the supermarket – all of these things become extreme hardships. If your driver’s license has been suspended or revoked, it does not mean there is no way to regain your driving privilege. Speak with a highly experienced attorney who has a proven track record for driver’s license restoration in Michigan.